Does Coloring Hair Cause Hair Loss? How to Stop Hair from Loss? You notice more loss of hair after applying color to your hair. Why? Coloring hair weakens your hair. Ammonia and peroxide is present in semi permanent and permanent hair coloring products. Hair cuticle is swollen and opened by the ammonia so that peroxide and dyes can get inside and result in a change of color. Use of a ph-balancing conditioner or color-stop shampoo closes these opening partially. The colored hair becomes weaker and porous due to this change in hair integrity; hence, they are more prone to breakage. Hair colors, which claim that they have no ammonia in it, use an ingredient that is like ammonia and it acts in a similar manner but produces no odor. Hair that are lightened or bleached are the most affected. Hair loss in people who color their hair routinely using permanent hair color is from breakage and is not permanent hair loss. Does coloring hair cause hair loss? While coloring hair may not result in permanent loss of hair; however, it can result in side effects leading to some loss of hair. One of the most common and damaging adverse effect of coloring is itching. When you scratch your itchy scalp, it results in damage to your hair and more loss of hair. If you notice hair loss after coloring your hair, you may have allergy to the hair dye. Hair dyes contain an ingredient called para-phenylenediamine. Due to severe allergic reactions to this chemical, it has been banned in France, Sweden and Germany. In case you develop hair loss, burning or itching within ten days after using a hair dye, stop its use and get yourself tested for a dye allergy. Wash hair less often and use cool or lukewarm water. If your hair are greasy, you don’t require to shower. Spray some dry shampoo in the roots of hair. It will absorb the oil and you are not required to rinse it. You should wash your hair with a shampoo that’s made for colored hair. Regular shampoos do not contain the ingredients that will make your hair retain their color and stay hydrated. Use conditioner on your hair after shampooing. Conditioner specifically designed for dyed hair works best. While conditioning particular attention should be paid to the hair endings. Don’t use hot products used for styling hair such as hair dryers or curling irons. Hair gets stressed by heat and may snap. Limit exposure to sun. Sun’s rays weaken hair and fade hair color, contributing to breakage. While going outdoors, wear a hat. Use an ammonia free hair color for your hair. Products containing ammonia strip lipids and ammonia out of hair. 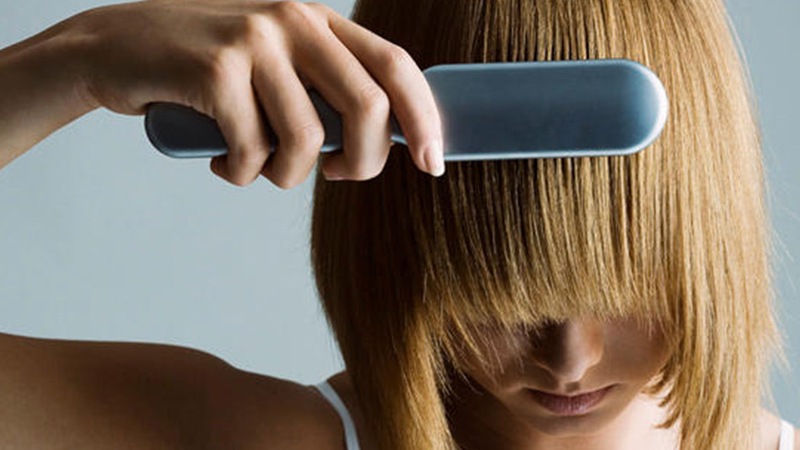 If your hair fall doesn’t stop, get a haircut as it will remove almost all of the dried hair. Does coloring hair cause hair loss? Yes. But there are other possible causes of hair loss. Deficiency of Vitamin D may lead to hair loss, which results from lack of exposure to rays of sun. Hence, go out in the sun more. However, if you live in a cold and windy environment, take a vitamin D supplement. Hair loss is also a symptom of deficiencies of amino acid lysine, zinc and copper. Also ensure that your protein intake is not less. Hair strands are made up of protein and if your diet is lacking protein, your body may divert it from producing hair to perform more important functions of the body. You can get protein from meat, eggs, legumes, nuts, seeds, milk and milk products. Hair loss may occur due to excessive stress and may last for several months. It is imperative to have knowledge of relaxation methods. Hair loss can be reduced by minimizing stress. You may try various relaxation techniques such as meditation, breathing exercises, aromatherapy etc. to help combat stress. You may also seek counseling if all else fails. Losing excess weight by following crash diets may also result in hair loss. You may notice the hair loss after a gap of 3-6 months following the weight loss. However, your hair may grow back when you start eating a healthy and well-balanced diet. Hair loss is more likely to occur in people whose diet is lacking in proteins or vitamin A. Though you may look funky in cornrows, but when they are taken out, a lot of hair loss also occurs. Similarly hair loss results if you make tight ponytails or use rollers quite often. Excessive amount of hair loss occurs as an adverse effect of both radiation and chemo therapy. While killing the cancer cells, the treatment also destroys the follicles of hair. However, the loss of hair is usually temporary and the hair grows again after the treatment is finished. As you age, the growth rate of hair decreases. The length of hair strand becomes shorter and it has less pigment. The hair becomes finer, grey and thinner. You should eat whole foods to maintain the health of your hair and body. According to estimates by the American Academy of Dermatology, 30 million American females are affected by hereditary hair loss. Although this type of hair loss most commonly occurs in late 50s or 60s it may occur even during teenage years.